AQUEST ANY HEM RECOLLIT 2687€! QUEDEN POCS DIES PER LA JORNADA SOLIDÀRIA! ENS VISITA L'EXPOSICIÓ DE LA CAMPANYA "EXCUSES O SEPARES". S'HAN REPARTIT CUBELLS MARRONS I PER LES RESTES ORGÀNIQUES. SI US HEU PERDUT LA DESFILADA DE CARNAVAL NO DUBTEU A CLICAR SOBRE LA MÀSCARA! DIMECRES 13 DE FEBRER, MESTRES I FAMÍLIES HEM TINGUT L'OPORTUNITAT D'ASSISTIR AL TALLER CONTRAFOC. UNA FORMACIÓ SOBRE COM SOBREVIURE A UN INCENDI. EL GRUP DE 4t "RÀDIO NO HO SÉ", DE RÀDIO ROSELLA, HA ENTREVISTAT EN MARC RIERA DE DR. PRATS! EL NOSTRE PROJECTE: "OBJECTIU: LA LLUNA"
S'APROPA EL CONCERT DE NADALES!! AQUEST ANY, COM A NOVETAT, FAREM EL CONCERT AL PAVELLÓ MUNICIPAL. US HI ESPEREM A TOTS I TOTES EL PROPER DIMECRES 19 DE DESEMBRE A LES 15H. COM CADA ANY, US ANIMEM A PARTICIPAR EN LA NADALA FINAL!!! AQUEST DIVENDRES, 16 DE NOVEMBRE, ALGUNS ALUMNES DE L'ESCOLA HAN PARTICIPAT EN LA TROBADA DE LES XEST. US ESPEREM EL PROPER DIMECRES 12!! RECORDEU QUE ELS ALUMNES DE PRIMÀRIA HAN D'ANAR AL PATI DE PRIMÀRIA, ON ELS ESPERARAN ELS SEUS TUTORS/ES. ELS ALUMNES D'INFANTIL S'HAN D'ACOMPANYAR A LES AULES. AIXÍ CONTINUEN CREIXENT ELS NOSTRES ERIÇONS! US CONVIDEM A INVESTIGAR EN EL SEU BLOC. DONEM L'ENHORABONA A LA GUANYADORA, LA Mª CARMEN ZARZOSO, ÀVIA DE LA LUCÍA PEINADO! ELS ALUMNES DE 6è HAN REPRESENTAT EL MÚSICAL "TEEN BEACH MOVIE" AMB UN GRAN ÈXIT! US DEIXEM UN VIDEO EXPLICATIU EMÈS A "VALLÈS EDUCA"
VA SER UN GRAN ÈXIT!!! ALUMNES DE 6è HAN PARTICIPAT A LES PROVES CANGUR AMB MOLT BONS RESULTATS!!! NO SABEU QUÈ LLEGIR????? US FALTEN BONES RECOMANACIONS??? ESTEU PENSANT EN LA PORTADA DE L'ANY QUE VE?? EL CONCURS ENCARA ÉS OBERT! A L'ESCOLA HO HEM CELEBRAT AMB DIFERENTS ACTIVITATS. DESTAQUEM LES SESSIONS DE MEDITACIÓ QUE HAN FET ELS ALUMNES DE PRIMÀRIA PER PART D'UNA ESPECIALISTA, LA GINA PARERA. US CONVIDEM A FER UNA ULLADA ALS BLOCS DE PRIMER I SEGON! AHIR VAM CELEBRAR LA DIADA DE SANT JORDI AMB UN GRAN ÈXIT!!! GRÀCIES PER LA VOSTRA PARTICIPACIÓ!! VESTIU LA NOVA AGENDA PEL CURS 2018-2019!!! VOLEU REGALAR UN LLIBRE PER SANT JORDI?! FAMÍLIES, NENS, NENES I MESTRES, HAN COL·LABORAT PER MILLORAR EL JARDÍ, CREAR UN GRAN MURAL I FER PETITS COLLAGES DEL BOSC. US CONVIDEM A FER UNA ULLADA ALS BLOCS D'EDUCACIÓ INFANTIL. ELS ALUMNES DE 3r DEL ROSELLA, COM ELS DE TOT CATALUNYA, ESTAN MOLT CONCENTRATS FENT L'AVALUACIÓ DIAGNÒSTICA DE COMPETÈNCIES BÀSIQUES. MOLTA SORT NENS I NENES!!! AVUI EL TEMPS ENS HA DONAT UNA TREVA I HEM POGUT GAUDIR D'UN GRAN DIA D'ESPORT I SOLIDÀRITAT! MOLTES GRÀCIES PER LES GANES I LA COL·LABORACIÓ!!! DEGUT A LES CONDICIONS METEOROLÒGIQUES PREVISTES PER DEMÀ DIMECRES, EL DEPARTAMENT D'ENSENYAMENT RECOMANA QUE ELS CENTRES EDUCATIUS ROMANGUIN OBERTS AMB UNS SERVEIS MÍNIMS I INFORMAR A LES FAMÍLIES QUE L'ACTIVITAT NO SERÀ NORMALITZADA"
EL PROPER 2 DE MARÇ US ESPEREM PER CELEBRAR UNA NOVA EDICIÓ DE LA JORNADA SOLIDÀRIA AMB SAVE THE CHILDREN. EL REI CARNESTOLTES HA MARXAT I LA GRESCA S'HA ACABAT! DIVENDRES A LA TARDA VAM GAUDIR D'UNA RUA BEN DIVERTIDA! I UN PETIT TAST EN ACCIÓ! MALGRAT LA PLUJA, AVUI HEM REBUT EL REI CARNESTOLTES! LES COOPERATIVES DE 5è "GUKI" I "WORLD OF BOATS" JA SÓN UN FET. ESTIGUEU MOLT ATENTS PERQUÈ MOLT AVIAT ENS INFORMARAN DELS PRODUCTES QUE FABRIQUEN I TAMBÉ DE COM ELS PODEM COMPRAR. HA SIGUT MOLT INTERESSANT I ENRIQUIDOR!!! EL CONCERT DE NADALES D'AQUEST ANY HA ESTAT UN ÈXIT! EL PROPER DIMARTS 19, A LES 15h, TINDRÀ LLOC EL CONCERT DE NADALES A L'AMFITEATRE DEL POBLE. COM CADA ANY, CONVIDEM LES FAMÍLIES A BAIXAR A L'ESCENARI I CANTAR AMB ELS MESTRES LA DARRERA NADALA "QUE TOT ET VAGI BÉ" DE TXARANGO. AL BLOC DE MÚSICA TROBAREU LA CANÇÓ. AQUEST CAP DE SETMANA HEM REBUT UN PREMI D'ESCOLES VERDES PEL PROJECTE QUE DUEM A TERME A L'ESCOLA SOBRE CONFORT ACÚSTIC. ENS AFEGIM A LA INICIATIVA! PODEU PORTAR LES BOSSES AMB ROBA DES DEL 26 D'OCTUBRE FINS AL 2 DE NOVEMBRE! AVUI HEM TINGUT EL PLAER DE REBRE LA DIRECTORA DELS SERVEIS TERRITORIALS DEL VALLÈS, SRA. CARME VIGUÉS, EL SOSTDIRECTOR I L'INSPECTOR DEL CENTRE. ACOMPANYATS TAMBÉ PER L'AJUNTAMENT DE VILADECAVALLS, HEM FET UN RECORREGUT PELS ESPAIS DE L'ESCOLA PER CONÈIXER EL CENTRE. AVUI DIVENDRES 22, HEM CELEBRAT EL DIA MUNDIAL SENSE COTXES! MOBILITZA'T PER UN AIRE MÉS NET! PRÀCTICAMENT ESGOTATS ELS MITJANS DE TRANSPORT PER DONAR NOM A LES CLASSES DE PRIMÀRIA. AQUEST CURS ENCETEM LES PROMOCIONS AMB NOMS RELACIONATS AMB LA CULTURA POPULAR CATALANA. ENS ESTRENEM AMB ELS CASTELLERS I ELS GEGANTS! EL CURS ESTÀ A PUNT DE COMENÇAR!! US ESPEREM A TOTS I A TOTES ELS DIMARTS 12 DE SETEMBRE!!! L'ÚLTIM DIA DE CURS, COM ÉS TRADICIÓ, VAM ACOMIADAR ELS ALUMNES DE SISÈ. ENS VAN CANTAR AQUESTA CANÇÓ TAN EMOTIVA! SI SOU ELS AFORTUNATS PASSEU PEL DESPATX A BUSCAR LA DAKOTA BOX QUE HEU GUANYAT!!!! ÈXIT TOTAL EN L'ESTRENA DEL MUSICAL "MATILDA"!! HEM PUBLICAT INFORMACIÓ INTERESSANT SOBRE L'AVALUACIÓ A PRIMÀRIA. SEGUINT LA LÍNIA ACTUAL DE FOMENTAR ACTIVITAS A L'EXTERIOR, AVUI 18 DE MAIG, ENS HEM SUMAT A LA CELEBRACIÓ DEL DIA MUNDIAL DE LES CLASSES A L'AIRE LLIURE. AVUI 4 DE MAIG I DEMÀ 5, ELS NENS I NENES DE 6è FAN LES PROVES DE COMPETÈNCIES BÀSIQUES. MOLTA SORT I MOLTA CONCENTRACIÓ!!!! AQUÍ TROBAREU UN PETIT TAST DEL DIA. PODEU TROBAR MÉS INFORMACIÓ A LA PÀGINA D'APADRINAMENT I ALS BLOCS DE NIVELL. ALS BLOCS DE NIVELL PODREU VEURE ELS CONTES. ELS NENS I NENES DE 2n HAN EXPLICAT EL SEU PROJECTE DE MEDITACIÓ A TOTA L'ESCOLA. TAMBÉ ENS HEM INICIAT EN EL MÓN DEL IOGA, APRENENT A RELAXAR-NOS MITJANÇANT UN CONTE. AVUI HEM CELEBRAT LA DIADA DE SANT JORDI AMB LA BALLADA DE DANSES I VENDA DE FLORS. ALS BLOCS DE NIVELL PODREU TROBAR MÉS INFORMACIÓ SOBRE AQUESTA DIADA. AL PATI DE PRIMÀRIA HEM INSTAL·LAT UNA NOVA ESTRUCTURA D'ESCALADA. "GENT ACTIVA = GENT MÉS FELIÇ!" AVUI 6 D'ABRIL, HEM CELEBRAT LA IV OLIMPÍADA SOLIDÀRIA! GRÀCIES PER LA VOSTRA COL·LABORACIÓ!!!! AQUESTA SETMANA ENS HA VISITAT EN DANI ZARZUELO, DIBUIXANT DE CÒMICS. AMB LA MARXA DEL REI CARNESTOLTES S'ACABA LA BOGERIA. ELS NENS I NENES DE 3r JA ESTAN A PUNT PER LES PROVES DE COMPETÈNCIES BÀSIQUES. ESTEM A LA SETMANA BOJA SI VOLEU ESTAR BEN INFORMATS VISITEU LA NOSTRA PÀGINA ESPECIAL CARNAVAL! A CICLE INICIAL TENIM UNA MASCOTA BEN DIVERTIDA QUE ENS AJUDA A INICIAR-NOS EN LA ROBÒTICA. CONEIXEU EL CONCURS "CONEIX LA TEVA ESCOLA" QUE ES FA AMB MOTIU DEL 30 ANIVERSARI DEL ROSELLA? FEU UNA ULLADA I ANIMEU-VOS A PARTICIPAR!! DES DEL ROSELLA US VOLEM DESITJAR UNES BONES FESTES NADALENQUES! AQUÍ US DEIXEM AMB UN PETIT TAST DE L'ÚLTIM DIA D'ESCOLA. REORDEU QUE PODREU TROBAR MÉS INFORMACIÓ ALS BLOCS DE NIVELL. EL CONCERT DE NADALES ES FARÀ DEMÀ DIMECRES, A LES 3 DE LA TARDA A L'AMFITEATRE. LA DARRERA CANÇÓ SERÀ COMPARTIDA ENTRE MESTRES I FAMÍLIES. US CONVIDEM A BAIXAR A L'ESCENARI! AQUÍ LA TENIU PER PODER PRACTICAR!! DILLUNS 28 ES VAN CELEBRAR LES ELECCIONS AL CONSELL ESCOLAR PEL SECTOR DE PARES I MARES. LES DUES NOVES MEMBRES SÓN SARAI ÁLVAREZ I ESTHER QUIJADA. L'escola s'afegeix a les activitats de la Setmana Europea de la Prevenció de Residus amb una activitat que s'estrena al menjador: " El menjar no es llença"
Des de TV3 han vingut a gravar l'InfoK d'avui perquè els expliquem què es fa a l'escola en relació a aquest tema. Els hem parlat del compostador, de l'hort i del projecte Recooperem. US DESITGEM UN BON ESTIU A TOTS/ES!!! SI TENIU AQUEST NÚMERO, JA PODEU PASSAR PEL DESPATX A RECOLLIR LA "DAKOTA BOX". LES ESTRENES DEL MUSICAL BOSCOS ENDINS HAN OMPLERT EL TEATRE DE GOM A GOM!! HAN GAUDIT I PRACTICAT DIFERENTS JOCS MALABARS I D'EQUILIBRIS. TROBAREU MÉS INFORMACIÓ ALS BLOCS DE CADA NIVELL. COM A CLOENDA, HEM GAUDIT D'UN ESPECTACLE DE CIRC MOLT DIVERTIT I EMOCIONANT! ELS NENS I NENES DE 5è PARTICIPEN AL BONGOH. ÉS TRACTA D'UN PROJECTE INTERNACIONAL DE TREBALL COOPERATIU. 4244'21€ ÉS LA QUANTITAT TOTAL QUE GRÀCIES A LA SOLIDARITAT DE LES FAMÍLIES DEL ROSELLA HEM FET ARRIBAR A SAVE THE CHILDREN. AMB LES APORTACIONS PER LA OLIMPÍADA I LA VENDA DE ROSES I PASTISSOS PER SANT JORDI HEM COL·LABORAT A REDUIR LA DESNUTRICIÓ INFANTIL. AHIR DIMECRES I AVUI DIJOUS HI HA MOLTA CONCENTRACIÓ A LES AULES DE 6è: ELS ALUMNES FAN LES PROVES DE COMPETÈNCIES BÀSIQUES. The planes class prepared a sensory box with recycled materials in the Science class. They presented the experiments to the thymes class. We had a Fun SCIENCE morning! Els alumnes de tercer van preparar a Science unes capses sensorials. Els alumnes de P-3 van jugar i practicar l’anglès! EL PROPER 22 D'ABRIL AL MATÍ CELEBRAREM LA DIADA DE SANT JORDI. EL PROPER DILLUNS ESTRENEM EL PRIMER CAPÍTOL DEL CONTE "EL TREN RÀPID QUE VA PER TOT EL MÓN"
TROBAREU AQUEST I ALTRES PROGRAMES A L'APARTAT DE RÀDIO. JA TENIU DISPONIBLE TOTA LA INFORMACIÓ SOBRE LA PREINSCRIPCIÓ PEL PROPER CURS. HO TROBAREU A L'APARTAT DE DOCUMENTS O CLICANT L'ENLLAÇ. VA SER UNA JORNADA EMOCIONANT I MOLT DIVERTIDA!!! LA RECAPTACIÓ D'AQUEST ANY HA SIGUT DE 2791€ QUE ANIRAN DESTINATS A L'ONG SAVE THE CHILDREN PER LLUITAR CONTRA LA DESNUTRICIÓ A BURKINA FASO. AGRAÏM MOLT LA VOSTRA PARTICIPACIÓ! ESTEM PREPARANT LA JORNADA SOLIDÀRIA!! AMB AQUEST PREGÓ DELS NENS I NENES DE 6è HA ARRIBAT EL REI CARNESTOLTES AQUEST ANY. US CONVIDEM A VEURE UN VIDEO DEL TALLER MUSICAL DE CICLE INICIAL. ESTAN TREBALLANT EL REI LLEÓ. EL RESULTAT DEL CONCERT DE NADALES VA SER MOLT BO!!! DEMÀ DIVENDRES, A LES 15H US ESPEREM A TOTS A L’AMFITEATRE DEL POBLE. ELS NENS I NENES DE L’ESCOLA FARAN LA TRADICIONAL CANTADA DE NADALES. COM HEM FET AQUESTS DARRERS ANYS, TANCAREM EL CONCERT AMB UNA NADALA QUE VOLEM CANTAR CONJUNTAMENT MESTRES, ALUMNES I FAMÍLIES. ANIMEU-VOS! AVUI ELS NENS I NENES D'EDUCACIÓ INFANTIL HAN FET LA TRADICIONAL CANTADA DE LLÚCIES. 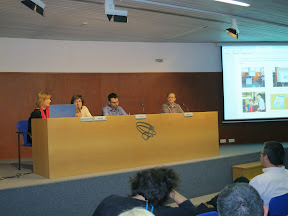 US PRESENTEM EL REPORTATGE EMÈS AL CANAL TERRASSA TV, SOBRE L'ESCOLA. MOSTRA DOS ASPECTES NOVEDOSOS DE L'ESCOLA COM SÓN: LA ROBÒTICA I EL ROCÒDROM DEL PATI DE PRIMÀRIA. ELS NENS I NENES DE CICLE MITJÀ HAN FET UN TALLER MOLT INTERESSANT. HAN FABRICAT INSTRUMENTS AMB MATERIALS RECICLATS. ELS I LES ALUMNES DE 6è FAN UN TALLER AL LLARG DEL CURS, ON APRENEN A PROGRAMAR AMB SCRATCH FENT NARRACIONS A LES QUE AFEGEIXEN MECANISMES LEGO WeDo. COM CADA ANY, DEMÀ 22 DE SETMBRE, ENS SUMEM A LA CELEBRACIÓ DEL DIA INTERNACIONAL SENSE COTXES. US ANIMEM A VENIR A L'ESCOLA CAMINANT O FENT SERVIR EL TRANSPORT PÚBLIC!! SI VENIU EN COTXE DES DE LLUNY, PODEU APARCAR AL PÀRQUING DEL CARRER DE LES ORENETES. AVUI DIVENDRES 18 A L'HORA DE L'ESBARJO, HEM INAUGURAT EL ROCÒDROM DEL PATI DE PRIMÀRIA. UN EXPERT EN ESCALADA DE "GRAVETAT ZERO" HA FET L'EXPLICACIÓ A ALUMNES I MESTRES I HA SUPERVISAT EL PRIMER MATÍ D'ESCALADA. FELICITEM ELS AUTORS DELS DIBUIXOS TRIATS PER IL·LUSTRAR L'AGENDA D'AQUEST CURS AMB EL TÍTOL "EL PATI IDEAL"! EN BREU PODREU VEURE UN MURAL AMB UNA MOSTRA D'ALTRES DIBUIXOS. EL TROBAREU AL COSTAT DE CONSERGERIA. Ahir vam rebre la visita de la Jadranka Mihalic i la Karmen Tavcar, directora i cap d'estudis de l'escola Kosovel Sezana a Eslovenia. Esperem que molt aviat compartirem Projecte Erasmus. COM CADA ANY, L'ÚLTIM DIA DE CURS VAM ACOMIADAR ELS NENS I NENES DE 6è QUE EL PROPER CURS JA NO ESTARAN A LA NOSTRA ESCOLA. VA SER UN MOMENT MOLT EMOTIU!! US DESITGEM MOLT SORT!!! FINS AVIAT!!!! UN COP MÉS, ELS ALUMNES DE 6è ENS VAN SORPRENDRE AMB UNA GRAN INTERPRETACIÓ. TROBAREU MÉS INFORMACIÓ I TOTA LA DOCUMENTACIÓ A L'APARTAT DOCUMENTS DEL MENÚ SUPERIOR. Els nens i nenes de 3r han fent les proves de matemàtiques, català i castellà de l'avaluació diagnòstica. Els resultats ens ajuden a analitzar i reorientar, si cal, activitats diàries. Tots els alumnes han de fer una exposició que permet valorar l'expressió oral en els 2 idiomes. AVUI, 29 D'ABRIL CELEBREM EL DIA MUNDIAL SENSE SOROLL. A L'ESCOLA ES FARAN DIVERSES ACTIVITATS RELACIONADES AMB EL TEMA. A LES 16H, A LA BIBLIOTECA DEL POBLE, ELS ALUMNES DE 3r PRESENTARAN EL PAISATGE SONOR DE VILADECAVALLS. US RECOMANEM EL BLOC DE SO I SOROLL ON HI TROBAREU MÉS INFORMACIÓ SOBRE EL TEMA I LES DIFERENTS ACTIVITATS. COM CADA ANY HEM CELEBRAT LA FESTA DE SANT JORDI AMB LA BALLADA DE DANSES. AMB AQUESTA ENDEVINALLA, ELS NENS I NENES DE P5 HAN QUEDAT FINALISTES EN UN CONCURS LITERARI. LA SEVA ENDEVINALLA SORTIRÀ PUBLICADA EN UN CALENDARI DE L'ANY VINENT. JA TENIU DISPONIBLE L'ENTORN SUVITA! ESTRENEM EL BLOC DE RÀDIO ROSELLA! US ANIMEM A FER-HI UNA ULLADA!!! L'APILO XII ATERRA AL ROSELLA!! JA TENIM L'APILO XII A L'ESCOLA I HEM COMENÇAT A OMPLIR-LO. ANIMEU-VOS A PARTICIPAR PORTANT PILES I ACUMULADORS VELLS. Hem aconseguit 2800 euros per Mali !!! Gràcies als alumnes, els mestres, les famílies i tots aquells que han ajudat a organitzar-ho, la jornada ha estat un dia festiu i ple d'emocions. La cursa solidària per nivells ha estat el moment més emocionant per cada participant. A més a més hi havia jocs per tothom, ulleres per mirar l'eclipsi amb seguretat, coques i pastissos per esmorzar i sobretot moltes ganes de participar i passar-ho bé. AMB MOTIU DE L'ARRIBADA DEL PRIMER VELER DE LA BWR, PREVIST PER LA SETMANA QUE VE, ELS NENS I NENES DE 5è HAN PUBLICAT UN PROGRAMA DE RÀDIO. JA PODEU CONSULTAR TOTA LA INFORMACIÓ A L'APARTAT JORNADA SOLIDÀRIA 2015 DINS D'ALTRES ACTIVITATS. COMENÇA EL PERÍODE DE PREINSCRIPCIONS!!!! DIMARTS, EL NAS VERMELL DURÀS I EL REI CARNESTOLTES BEN CONTENT VEURÀS! DIMECRES, LES CAMES BEN ABRIGADES TINDRÀS, PERQUÈ ELS MITJONS PER SOBRE ELS PANTALONS LLUIRÀS! DIJOUS, EL CABELL DECORAT PORTARÀS: PINTURA, GARLANDES O PERRUCA I UN TIP DE RIURE FARÀS! El passat dissabte, 31 de gener, l'Àngels i la Cesca van participar amb una ponència en la jornada "Control del Ruido en las Aulas" organitzada per l' associació Ulertuz (Asociación de Familias, Amigos y Amigas de niños y niñas sordas de Bizkaia). L'objectiu d'questa trobada era informar i sensibilitzar els profesionals dels centres educatius de Biscaia sobre el problema que implica el soroll en la salut i aprenentatges dels alumnes i molt especialment en aquells nens i nenes que presenten dificultats en l'audició. Podeu accedir a més informació sobre la Jornada a través dels següents enllaços: "Shh... so i soroll" i Ulertuz"
AVUI 30 DE GENER SE CELEBRA EL DIA ESCOLAR DE LA NO VIOLÈNCIA I LA PAU. A L'ESCOLA HEM PARLAT DEL TEMA I HEM FET DIFERENTS ACTIVITATS. Hem rebut instruccions del CECAT en relació a les fortes ventades previstes per les pròximes hores. Us informem que tenim previstos els espais de confinament per qualsevol eventualitat i que l'escola suspendrà les activitats a l'aire lliure mentre duri l'alerta, incloses les extraescolars. Us agrairem que eviteu els desplaçaments innecessaris i el joc a l'exterior de casa. Us agrairem que mantingueu la calma i confieu que us informarem de qualsevol novetat al respecte. FAMILIES!!! JA TENIU DISPONIBLE LA NADALA PERQUÈ PUGUEU PRACTICAR! EMMARCAT EN ELS ACTES DEL TRICENTENARI, ELS ALUMNES DE 4t I P4 HAN REALITZAT CONJUNTAMENT UNA ACTIVITAT D'ELABORACIÓ D'ESTELS. LA CLOENDA D'AQUESTA ACTIVITAT HA SIGUT AQUEST DIMECRES, QUAN A LES 10 EN PUNT HAN FET ENLAIRAR ELS ESTELS. COM CADA ANY, ELS NENS I NENES DEL ROSELLA FARAN UN CONCERT DE NADALES A L'AMFITEATRE DEL POBLE. US HI ESPEREM EL DIA 19 A LES 3 DE LA TARDA. COM A CLOENDA DEL CONCERT, CANTARÍEM UNA NADALA COMPARTIDA FAMÍLIES I MESTRES. Amb l'objectiu de preparar el projecte Erasmus, l'Elisabet Escudé i la Lina Espel han estat durant dos dies a l'escola sueca de Fladängskolan, a Lomma. Un dels punts forts del seu sistema educatiu són les classes a l'aire lliure: Outdoor Education. Avui ens ha visitat en Dídac Costa. Ell, juntament amb l'Aleix Gelabert, són dos catalans que participaran per primera vegada, en la BWR que començarà el 31 de desembre de 2014. Tripularan un veler anomenat “One planet – one ocean”, amb la doble missió de prendre mostres d'aigua per fer un estudi ambiental de l'estat del oceans. Torns de tres hores per dormir, menjar liofilitzat, fer-se extirpar l'apèndix... Són algunes de les dificultats que han de superar els tripulants de cada veler del BWR. Ha estat una visita sorprenent i molt interessant. Els alumnes de 5è us seguiran al llarg de tot el viatge. AQUEST 24 DE NOVEMBRE HEM CELEBRAT ELECCIONS AL CONSELL ESCOLAR. ELS ALUMNES DE CICLE SUPERIOR DE L'ESCOLA VAN ANAR AL EL BORN I VAN EXPLICAR LA VISITA I EL TALLER AL PROGRAMA CATAKRAC. EL PROPER 3 DE NOVEMBRE INICIEM EL PROCÉS D' ELECCIONS AL CONSELL ESCOLAR. JA PODEU CONSULTAR LA CARTA DEL MES A LA NOSTRA WEB. RECORDEU QUE LA PODEU TROBAR CADA MES A L'APARTAT DE DOCUMENTS. EL PROPER DILLUNS ÉS EL DIA MUNDIAL SENSE COTXE I DES DE L'ESCOLA VOLEM PARTICIPAR-HI UN ANY MÉS. US ANIMEM A APARCAR EL COTXE I LA CONTAMINACIÓ QUE SUPOSA PER UN DIA I QUE VINGUEU A L'ESCOLA CAMINANT, EN BICICLETA O TRANSPORT PÚBLIC. RECORDEU QUE ELS ALUMNES DE PRIMÀRIA HAN D'ESTAR A LES 9:00 AL PATI DE L'ESCOLA. ELS ALUMNES D'INFANTIL S'HAN D'ACOMPANYAR FINS A LA SEVA CLASSE. PODEU TROBAR INFORMACIÓ IMPORTANT DE CARA AL NOU CURS A L'APARTAT D'ESCOLA, CALENDARI ESCOLAR. US INFORMEM QUE PODEU CONSULTAR INFORMACIÓ IMPORTANT DE CARA AL CURS VINENT ALS DIFERENTS APARTATS DE LA WEB. DESPRÉS, ELS GRANS ENS VAN REGALAR A TOTS UNS BALLS I UNES PARAULES DE COMIAT MOLT EMOTIVES. 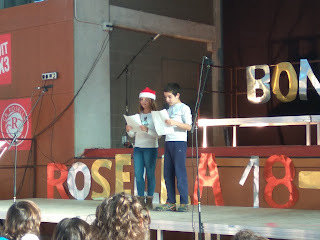 Quinzè musical dels alumnes de 6è del Rosella!! Aquest final de curs han representat High School Musical davant un amfiteatre ple de gom a gom. Vam gaudir d'un espectacle divertit amb actors i actrius que tenen un gran futur. A l'acabar l'acte l'ajuntament va oferir a l'escola una placa en reconeixement als 15 anys de Taller de Teatre. FA UNS DIES ENS VAM ADONAR DE LA PRESÈNCIA D’UNS CONVIDATS BEN ESPECIALS. UNA PARELLA DE CUERETES BLANQUES HAN FET EL SEU NIU A LES HEURES DE LA NOSTRA ESCOLA. AQUESTS PARES INTENTEN CRIAR ELS SEUS POLLETS EN MIG DEL NOSTRE DIA A DIA, OFERINT-NOS L’OPORTUNITAT DE GAUDIR EN VEURE’LS. US DEMANEM TINGUEU LA MÀXIMA CURA. 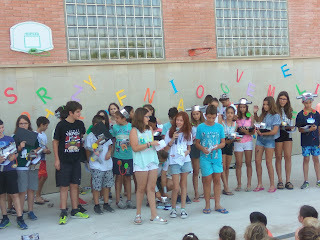 El dijous 5 de juny a la tarda els alumnes de 6è van fer la presentació del projecte “Carrers de Viladecavalls amb codi QR” a la Biblioteca del poble. A partir d’ara ja podeu accedir als blocs informatius si llegiu les plaques amb els codis pels carrers del poble. Representants del departament i de l’ajuntament i veïns del poble van valorar molt positivament aquest projecte, que suposa una novetat turística amb la incorporació de les noves tecnologies. AVUI HEM FET LES FOTOS DE GRUP D'AQUEST CURS. COM CADA ANY, A FINAL DE CURS CADA NEN/A TINDRÀ LA SEVA FOTOGRAFIA I TAMBÉ PODREU TROBAR LA DE TOTS ELS GRUPS A LA PÀGINA WEB DE L'ESCOLA. AGRAÏM LA COL·LAORACIÓ DEL Sr. LUÍS BUENO! AQUEST DIVENDRES, ELS NENS I NENES DE 5è DEL ROSELLA I DEL ROC BLANC VAN PARTICIPAR EN LA 6a JORNADA ESPORTIVA. ES TRACTA D’UN PRIMER CONTACTE PER ESTABLIR VINCLES DE FORMA LÚDICA. AMB MOTIU DEL DIA SENSE SOROLL, S’HA ORGANITZAT A TERRASSA LA JORNADA “MENYS SOROLL, MÉS ACÚSTICA”. LA NOSTRA ESCOLA HI HA PARTICIPAT AMB LA PRESENTACIÓ “SHHH... SO I SOROLL”. S’HAN PRESENTAT DIFERENTS ÀMBITS I HA SIGUT MOLT INTERESSANT! US CONVIDEM A FER-HI UNA ULLADA. AVUI I DEMÀ, ELS NENS I NENES DE SISÈ FARAN LES PROVES DE COMPETÈNCIES BÀSIQUES DEL DEPARTAMENT. US POSEM UN TASTET DE LES DANSES, TROBAREU MÉS IMATGES I VIDEOS ALS BLOCS DELS NIVELLS. L'ESCOLA CELEBRA EL DIA MUNDIAL SENSE SOROLL. UNES PROFESSIONALS DE GAES HAN VINGUT A L'ESCOLA A FER UNA XERRADA ALS MESTRES PER INFROMAR-LOS DE LA IMPORTÀNCIA DE CUIDAR BÉ L'OÏDA I DE COM DETECTAR POSSIBLES DEFICIÈNCIES AUDITIVES EN ELS ALUMNES. AQUESTA INFORMACIÓ ES PORTARÀ A LES AULES, ON S'ESTABLIRÀ UN DEBAT SOBRE EL TEMA PER TAL DE SENSABILITZAR AL RESPECTE. HEM ESTRENAT UN NOU APARTAT A LA NOSTRA WEB: ESCOLA DE PARES. UN ESPAI ON ANIREM PENJANT DOCUMENTS QUE US PODEN INTERESSAR. Aquest dissabte 12 d’abril a les 12:00h al Canal Súper3 podreu veure el programa en anglès Fish & Chips on van participar els alumnes de cicle superior de la nostra escola. Us recomanem que consulteu la programació del canal el dia d’abans per si hi hagués algun canvi. Al llarg de dos dies els representants d'una escola de Suècia i una de Polònia estan a l'escola treballant conjuntament amb mestres del Rosella per tal de proposar un projecte Erasmus pels dos propers cursos. L'objectiu del projecte és comparar i aprendre noves metodologies de treball. Les visites a l'escola per part de persones d'altres països suposen una gran motivació per mestres i alumnes per aprendre Anglès, ja que l'ús d'aquest idioma per qualsevol intercanvi d'informació és fonamental. S'APROPA LA FESTIVITAT DE SANT JORDI. ANIREU TROBANT INFORMACIÓ AL RESPECTE AL MENÚ, A "ALTRES ACTIVITATS". DURANT LA SETMANA PASSADA ELS NENS I NENES DE 3r, 4t I 5è VAN FER L'ACTIVITAT DEL BARÇAKIDS. HAN ESTAT TREBALLANT ELS VALORS A L'ESPORT. SI VOLEU SABER MÉS CLIQUEU LA FOTO! LA JORNADA SOLIDÀRIA HA ESTAT UN ÈXIT! HI HAURÀ UNA PESTANYA PERMANENT AL MENÚ SUPERIOR!! AHIR DILLUNS VA ARRIBAR EL REI CARNESTOLTES AMB LA SEVA BOGERIA. JA PODEU VEURE LES FOTOS I LLEGIR EL PREGÓ. AL LLARG DE LA SETMANA BOJA ANIREM AFEGINT MÉS IMATGES. US PODEU INFORMAR PERMANENTMENT A LA PESTANYA "CARNAVAL" DINS D'"ALTRES ACTIVITATS"
El dijous 19 de febrer vam recollir de mans de la consellera Irene Rigau la tablet que ens van regalar en quedar finalistes en el concurs Mobile Learning Awards 2014. En el següent enllaç podeu veure els treballs que van quedar finalistes; tots ells tenen en comú l'ús de dispositius mòbils a l'escola. Aquest reconeixement ens anima a continuar fent tasques innovadores que afavoreixin la competència digital dels nostres alumnes. S'APROPA LA JORNADA SOLIDARIA 2014!!!! PODEU INFORMAR-VOS CLICANT A L'ENLLAÇ O PERMANENTMENT A LA PESTANYA DEL MENÚ "FIRA SOLIDÀRIA", ON TAMBÉ TROBAREU INFORMACIÓ D'ALTRES ANYS. 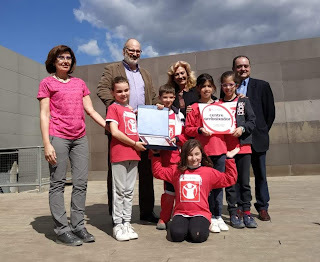 EL DIARI "TERRASSA INFORMA" HA PUBLICAT UNA NOTÍCIA REFERENT A LA SORTIDA QUE VAN FER ELS NENS I NENES DE LA CLASSE DE P5B AL CLUB NATACIÓ TERRASSA COM A CLOENDA DEL SEU PROJECTE "ELS NEDADORS"
AHIR DIMECRES, VAM CELEBRAR EL TRADICIONAL CONCERT DE NADALES DE LA NOSTRA ESCOLA. VA SER UN ACTE MOLT EMOTIU I VOLEM AGRAIR LA VOSTRA PARTICIPACIÓ, GRÀCIES A LA QUAL, VA SER UN ÈXIT. ESPEREM QUE GAUDISSIU DE L’ACTE. PODEU VEURE LES FOTOS I EL VÍDEO DE LA NADALA COMPARTIDA I US ANIMEM A VISITAR ELS DIFERENTS BLOCS ON PODREU TROBAR MÉS VÍDEOS. US POSEM TAMBÉ UNES FOTOS DE LES ACTIVITATS QUE HEM FET EL DARRER DIA DEL TRIMESTRE. AQUEST DIMARTS HEM FET A L’ESCOLA EL COMIAT DEL LLUÍS. EL NOSTRE CONSERGE ES JUBILA I TOTS ELS MEMBRES DE L’ESCOLA ENS HEM VOLGUT ACOMIADAR I MOSTRAR-LI LA NOSTRA ESTIMA PER TOT EL TEMPS COMPARTIT AMB NOSALTRES. GRÀCIES LLUÍS PER HAVER-NOS AJUDAT SEMPRE I SOBRETOT, HAVER ESTAT UN GRAN COMPANY PER TOTS ELS MESTRES, UN REFERENT PELS ALUMNES I FAMÍLIES I UN PUNTAL PER LA NOSTRA ESCOLA. Els nens i nenes del Rosella van pintar un munt d’espelmes per col·laborar en la Marató de TV3. Els dies 4 i 5 de desembre , l’AMPA va vendre les espelmes a totes les famílies que en volien i van recaptar més de 200 euros. Moltes gràcies a tots per la vostra solidaritat!! FAMÍLIES, AQUEST ANY LA NADALA QUE CANTEM ELS MESTRES AL CONCERT DE NADAL SERÀ UNA MICA DIFERENT. US CONVIDEM A PARTICIPAR-HI CANTANT AMB NOSALTRES. CANTAREM LA CANÇÓ “POTS SOMIAR UNA MICA EN MI”. PODEU TROBAR AQUESTA CANÇÓ AL CD DE LA MARATÓ D’AQUEST ANY (LA NÚMERO 9). VOLEU PRACTICAR AMB EL KARAOKE? INCLÒS AL PROJECTE PILE, AQUEST ANY S’ESTÀ DUENT A TERME UN TREBALL SOBRE ELS SENTIMENTS DINS DEL TALLER “FEELINGS”, A CICLE INICIAL. US CONVIDEM A DESCOBRIR-LO SEGUINT EL SEU BLOC! TENIU UN ENLLAÇ PERMANENT AL MENÚ DE L’ESQUERRA. A LES 9 A CLASSE!!! EL PROPER DIUMENGE 17 DE NOVEMBRE, A LES PISTES MUNICIPALS D'ATLETISME DE CAN JOFRESA (TERRASSA), TINDRÀ LLOC LA JORNADA DE CROSS ESCOLAR. DATA MÀXIMA D'INSCRIPCIÓ 11 DE NOVEMBRE. Dimecres 17 d’octubre es va celebrar el II Fòrum d’Escoles Verdes del Vallès a l’auditori de Sant Cugat. Els 3 ecodelegats de 6è, la Cesca i la Lina vam participar activament en aquest fòrum, que ens ha aportat moltes idees i ganes per continuar treballant en la línia de la sostenibilitat. DIJOUS 10, VAM REALITZAR UNA ACTIVITAT D'APADRINAMENT A L'ESCOLA, ON ELS NENS I NENES DE CICLE MITJÀ I SUPERIOR VAN AJUDAR ELS SEUS PADRINS MÉS PETITS A POSAR TAPS A LES POTES DE LES CADIRES PER ACONSEGUIR REDUIR EL SOROLLS DE L'ESCOLA. US RECOMANEM VISITAR EL BLOC DE SO I SOROLL ON PODEU INFORMAR-VOS AMB MOLT MÉS DETALL D'AQUESTA INTERESSANT ACTIVITAT I ELS SEUS BENEFICIS. EL DIVENDRES 20 VAM CELEBRAR EL DIA SENSE COTXE. EL CANAL DE TELEVISIÓ "TERRASSA VALLÈS, ES VA INTERESSAR PER L'ACTIVITAT I VA FER UN PETIT REPORTATGE QUE ES VA EMETRE AL TELENOTÍCIES. EL DIARI "LA VANGUARDIA" HA PUBLICAT UN REPORTATGE SOBRE EL SOROLL TITULAT "PEDAGOGIA CONTRA EL RUIDO". EN ELL, FA REFERÈNCIA A LA NOSTRA ESCOLA I A LA FEINA QUE ES FA PER TREBALLAR AQUEST PROBLEMA. US RECORDEM QUE A L'APARTAT DE DOCUMENTS HI PODEU TROBAR DIFERENTS INFORMACIONS DEL VOSTRE INTERÈS. El dia 22 de setembre se celebra el Dia Sense Cotxe. ... però molt especialment el DIVENDRES 20 farem que això sigui possible. Mireu el vídeo que els companys de cicle superior van editar per convèncer a tots els nens i nenes que venir caminant a l’escola “mola”. Si malgrat tot heu d’arribar al poble amb cotxe, us recomanem aparcar al pàrquing del carrer de les Orenetes per aconseguir que els voltants de l’escola siguin un gran espai sense cotxes durant tot el divendres 20 de setembre. Us volem recordar que , moure’s en bicicleta pel poble o caminar per anar a l’escola en comptes d’agafar el cotxe pot jugar un paper molt important en la salut. Si tots fem petites modificacions en el dia a dia podem aconseguir grans canvis. Dijous, a l'auditori de Viladecavalls, un gran nombre de professionals de l'ensenyament del municipi vam poder assistir a la conferència d'en Blai Gasol. Com sabeu el tema era la nova llei que el govern espanyol té intenció d'imposar el més aviat possible. La conferència " L'educació a Catalunya des de la transició fins a la llei Wert" va ser molt enriquidora i va ajudar a conèixer l'abast d'aquest canvi legislatiu. L'EMPRESA QUE GESTIONA EL MENJADOR DE L'ESCOLA ROSELLA A PARTIR DE SETEMBRE ÉS ISS FACILITY SERVICES. LA REUNIÓ INFORMATIVA SERÀ EL DIJOUS 12 A LES 17h AL MENJADOR DE L'ESCOLA. FAMÍLIES, AQUÍ PODEU CONSULTAR INFORMACIONS IMPORTANTS DE CARA AL CURS VINENT. APROFITEM TAMBÉ PER DESITJAR-VOS UN BON ESTIU! VEIEU DE QUÈ ELS VAN VESTIR! VAN SER MOMENTS EMOTIUS! S'ACABA UNA ETAPA MOLT IMPORTANT I EN COMENÇA UNA ALTRA. US DESITGEM MOLTA SORT!!! A LA RESTA.... BON ESTIU I US ESPEREM EL CURS VINENT!!! L'AFORTUNAT O AFORTUNADA POT PASSAR PEL DESPATX A RECOLLIR EL SEU PREMI: UN SMARTBOX "ESTADA GASTRONÒMICA"
AHIR ELS ALUMNES DE 6È VAN REPRESENTAR EL MUSICAL MAMMA MIA A L’AMFITEATRE DE POBLE. UN ANY MÉS VAM TENIR UNA VETLLADA MEMORABLE I VAM GAUDIR D’UN GRAN ESPECTACLE. FELICITATS!! VEGEU UNA GRAVACIÓ DE LA COREOGRAFIA FINAL. MOLT AVIAT PODREU VEURE LES FOTOGRAFIES A LA WEB I AL SETEMBRE JA HI HAURÀ EL DVD DISPONIBLE. HO PODEU TROBAR A L'APARTAT DE DOCUMENTS O BÉ CLICANT-HI A SOBRE. AVUI COMENÇA L'HORARI DE LA JORNADA INTENSIVA. RECORDEU QUE LES CLASSES SERAN DE 9:00 A 13:00h. UN ANY MÉS L’ESCOLA HA PARTICIPAT EN EL CONCURS DE DIBUIX ESCOLAR ORGANITZAT PER L’ANTIGA ENTITAT UNNIM. I UN COP MÉS UNA ALUMNA DE L’ESCOLA HA ESTAT ENTRE ELS GUANYADORS. VOLEM FELICITAR LA LAURA MELGAR, DE 4t, QUE PER SEGON CURS CONSECUTIU HA FET UN DIBUIX DIGNE DE SER PREMIAT. MIREU LE FOTOGRAFIES DEL DISSABTE 25 DE MAIG A L’ACTE DE L’ENTREGA DE PREMIS AL CENTRE CULTURAL. L’ACTIVITAT “ITINERARI DE VILADECAVALLS A CAN SANAHUJA AMB CODIS QR” VA ESTAR PUBLICADA A LA WEB DE “L’ASSOCIACIÓ INTERNACIONAL DE CIUTATS EDUCADORES (AICE)” FA UNS MESOS. AQUEST MES DE JUNY, S’HA PUBLICAT L’ACTIVITAT COM A DESTACADA. DES D'AQUÍ PODEU ACCEDIR A L’ARTICLE QUE FA REFERÈNCIA. L'1 DE JUNY ES CELEBRA L'ÚLTIMA TROBADA PER INFANTIL I PRIMÀRIA. Molta concentració i una mica de nervis davant les proves de competències bàsiques a 6è. Els dies 7 i 8 de maig tots els alumnes de 6è, els tutors i 2 controladors externs estan enfeinats amb la realització de les 4 proves que el departament prepara i avalua per a totes les escoles de Catalunya. D’aquí unes setmanes rebrem els resultats, que estem segurs que seran bons, com han estat en els cursos anteriors. EL SR LLUÍS BUENO, PARE D’EN MARC I EN JAN I FOTÒGRAF, HA VINGUT A L’ESCOLA A FER LES FOTOGRAFIES DE TOTS ELS GRUPS. COM CADA ANY, TINDREU AQUESTES FOTOGRAFIES A LES PORTADES DELS ÀLBUMS DE FINAL DE CURS. MOLTES GRÀCIES PER AJUDAR-NOS A CONSTRUIR AQUEST RECORD!!! La setmana del 20 al 27 de maig vaig participar en una Vista d'Estudis sobre la CONCIENCIACIÓ DE LA NECESSITAT DE PROTEGIR EL MEDI. Va ser molt interessant intercanviar idees i opinions sobre aquest tema amb altres directores d'escoles de països com Suècia, Finlàndia, Alemanya o Grècia. AQUESTA SETMANA HEM CELEBRAT SANT JORDI AMB DIFERENTS ACTIVITATS. LA BALLADA DE DANSES I LACELEBRACIÓ DE LA IV FIRA SOLIDÀRIA DEL ROSELLA VAN SER UN ÈXTIT! FEU UNAULLADA! FINS I TOT EL BON TEMPS ENS VA FER COSTAT! TAMBÉ HEM COMENÇAT A FER UN APADRINAMENT DE LECTURA. DURANT DUES SESSIONS ELS NENS I NENES MÉS GRANS HAN COMPARTIT UNA ESTONA DE LECTURA AMB UN NEN O NENA MÉS PETIT. HA SIGUT UNA ACTIVITAT MOLT POSITIVA I ENRIQUIDORA. PER CONCLOURE AMB ELS ACTES DE LA FESTA, ELS NENS I NENES D’EDUCACIÓ INFANTIL HAN EXPLICAT EL CONTE QUE HAN ELABORAT AL MÉS GRANS. US ANIMEM A VISITAR ELS BLOCS DELS DIFERENTS NIVELLS ON PODREU VEURE MÉS DETALLS I FOTOS DE LES ACTIVITATS. CONSCIENCIATS AMB EL TEMA DE LA CONTAMINACIÓ ACÚSTICA, DES DE L’ESCOLA ESTEM TREBALLANT EL TEMA DEL SOROLL I EL SILENCI. AMB MOTIU DEL “DIA MUNDIAL SENSE SOROLL” QUE S’HA CELEBRAT EL 24 D’ABRIL, S’HAN FET DIFERENTS ACTIVITATS DE SENSIBILITZACIÓ. US CONVIDEM A VISITAR EL BLOC DE "SO I SOROLL" ON PODREU TROBAR TOTA LA INFORMACIÓ SOBRE EL TEMA. LES COLÒNIES DELS NENS I NENES DE 2n ESTAN MÉS A PROP! LES VACANCES S'HAN ACABAT I JA ESTEM PREPARATS PEL TERCER TRIMESTRE!! ALGUNES FAMÍLIES HAN COMENÇAT A PORTAR LES SEVES MANUALITATS DE PRIMAVERA PER DECORAR L'ESCOLA. EL DIVENDRES 22 DE MARÇ ÉS EL DIA MUNDIAL DE L'AIGUA. PER CELEBRAR-HO, DES DE L'ESCOLA, S'HAN FET DIVERSES ACTIVITATS. ALS BLOCS DELS DIFERENTS NIVELLS TROBAREU INFORMACIÓ MÉS DETALLADA. JA HA ARRIBAT! EL DIA 20 VAM ESTRENAR ESTACIÓ NOVA! US DEMANEM AJUDA PER PREPARAR LA DECORACIÓ DE LA PRIMAVERA. GRÀCIES! EL Sr. EMILI MIGUEL HA VINGUT A FER UNA XERRADA SOBRE ECONOMIA A LA CLASSE DE SISÈ. US CONVIDEM A VISITAR EL BLOC DE SISÈ. SEGUEIX EL PROCÉS PAS A PAS!! EL REI CARNESTOLTES VA SORTIR A PASSEJAR I TOTS ELS VAM SEGUIR PELS CARRERS DE VILADECAVALLS!! DESRPÉS A L'ESCOLA UN CONCURS DE COMPARSES VAM CELEBRAR!!! VISCA LA FESTA!! VISCA LA GRESCA!! LA DISBAUXA HA ARRIBAT A LA NOSTRA ESCOLA!!! SÍ, EL REI CARNESTOLTES ÉS AQUÍ!! AQUEST ANY VE VESTIT DE CONTENIDOR DE RECICLATGE. ELS NENS I NENES DE SISÈ HAN FET UN PREGÓ BEN ESBOJARRAT!! JA TENIM EL DISTINTIU D'ESCOLA VERDA!! PER CELEBRAR-HO, EL DIVENDRES 25, VAM FER UNA FESTA. AQUÍ TENIU ALGUNES FOTOS! LA ROSA, LA MARE DEL POL I LA QUERALT DE MIGUEL, HA VINGUT A FER UNA XERRADA A LA CLASSE DE PRIMER, SOBRE SUBMARINISME. US ANIMEM A VISITAR EL BLOC DE CICLE INICIAL I FER-HI UNA ULLADA!